A new school backed by Global can reduce "the barriers to entry" for people looking to get into the media industry, the company's founder declared at its royal opening. 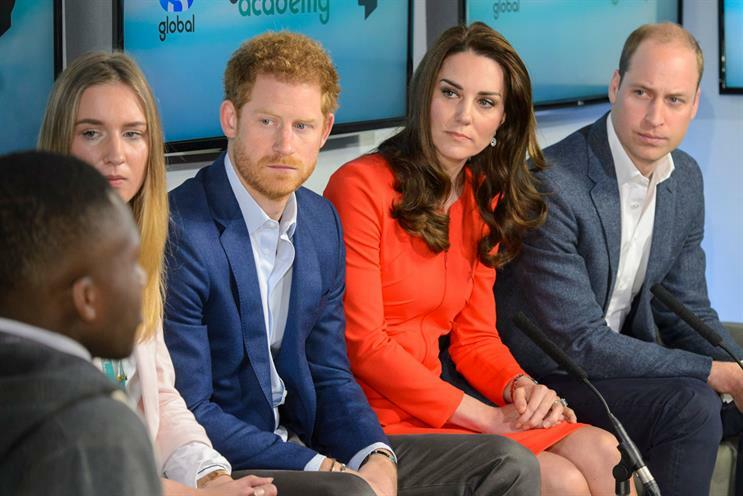 With the Duke and Duchess of Cambridge and Prince Harry listening on stage at the Global Academy, Ashley Tabor described the state school and technical college for 14- to 19-year-olds in Hayes, west London, as a way to tackle the "skills shortage" and "lack of diversity" in the media sector. "For a long time, I’ve been mindful about how difficult it can be to get into the media business," Tabor, who founded Global a decade ago, told the audience, which included about 100 students. "The reality is young people often leave school without the practical and technical skills they need to prepare them for working life and indeed for adult life." He added that Global, Britain’s biggest radio group and the owner of the Capital, Classic, LBC and Heart brands, wanted the academy to be "an environment of entrepreneurialism where ambition and success are encouraged". Tabor, whose father Michael made a fortune from bookmaking and financial investments, left school at 16, said: "I wish there had been somewhere like this to learn my passion, radio, when I was 14." Princes William and Harry and the Duchess of Cambridge attended in their role as supporters of Heads Together, the charity that tackles mental illness. Simon Collins, the principal of the Global Academy, said there has "never been so much pressure on young people", partly because of social media. Helping students to have "a healthy mind" is as important as having "a healthy body" and the "core education and skills" that they learn, he said. As part of the opening ceremony, Tabor showed Prince William the original microphone used by his great-grandfather, George VI, to make his celebrated "King’s Speech". The Global Academy is on the site of EMI’s old vinyl factory and the record label’s archive, which includes the microphone, is housed in a nearby building. Hayes is one of London’s less affluent boroughs on the outskirts of west London, although there was once a thriving business district because of EMI. The Global Academy is part of an effort to revive the area and the new Crossrail train service, called the Elizabeth Line, will pass through Hayes. The school opened initially for students in years 10 and 12 last September but will expand to take up to 800. The new, state-of-the-art building includes TV and radio recording studios. Global presenters and executives frequently visit the academy to meet students. LBC’s Nick Ferrari and Heart’s Jamie Theakston and Emma Bunton attended the royal opening. Global and the Tabor family’s charitable foundation have jointly sponsored the academy with the University of the Arts London. Several other media owners have educational initiatives, including Sky, which has launched its Sky Academy to help young people looking to get into the media.